This article originally appeared in the Deseret News on Jun 26th, 2017. One of Utah’s great founding fathers, George A. Smith, was born 200 years ago on Monday in Potsdam, a village in northern New York. His life deserves to be remembered and celebrated. Arguably, he was second only to Brigham Young in providing leadership to the territory that would become the State of Utah. George A., as he was affectionately known, served in the Territorial Legislature for 19 years, was a vigorous promoter of Utah statehood and a chief colonizer of Utah, Iron, Washington and Kane counties. He helped lay out and establish the communities of Parowan, Cedar City and Santa Clara. St. George was named in his honor. He promoted the transcontinental railroad and cooperative industries including the ZCMI. During the Utah War, he rallied resistance to the approach of Johnston’s Army. George A. was an early convert to The Church of Jesus Christ of Latter-day Saints, founded by his first cousin Joseph Smith. In the Spring of 1834, as a 16-year-old, he walked 1,600 miles as a member of the Zion’s Camp expedition. He was asked to serve in the First Quorum of Seventy at 18 and when only 22, became a member of the church’s Quorum of the Twelve Apostles. He was one of the early missionaries to England, introducing the Mormon message to the people of London. After the deaths of Joseph and Hyrum Smith, he helped organize the trek west, arriving with the first company of pioneers in 1847. George A. served the church in his capacity as an apostle, historian and recorder and first counselor in the First Presidency to Young. In all these responsibilities he made enormous contributions. He is credited as church historian with laying the foundation for the work that continues in that office today. 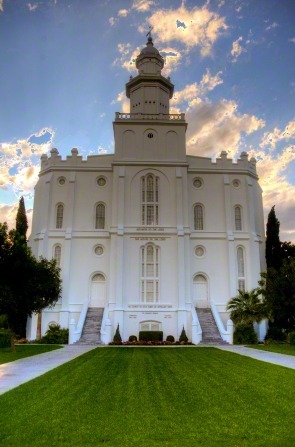 Likewise, the construction of the St. George Temple was due in large measure to his efforts. St. George Temple. Courtesy of the LDS Media Library. In stature, George A. was imposing, standing at nearly 6 feet in height and weighing more than 250 pounds. He also possessed a larger than life personality. He was by all accounts a charismatic speaker, lacing his discourses with humor, historical anecdotes and sage counsel. George A. struggled with serious health problems all his life, and on Sept. 1, 1875, at the relatively young age of 58, he died at Salt Lake City home from pneumonia. “By his removal to a higher sphere, I will lose a devoted friend, a wise counselor, and a lifelong companion. He leaves behind him, so far as my knowledge extends …, a record as pure and as worthy of imitation as that of any servant of the Most High, who ever lived upon His footstool. He gave his heart, his mind, his energy, his love, in fact his all, to the furtherance of the great purposes of our God. Richard N. W. Lambert is vice chairman of Mormon Historic Sites and a retired assistant United States attorney.